AfDB to launch regional economic outlook reports. The African development Bank (AfDB) has observed that the fragile security conditions in the northern part of Nigeria, Mali and Niger Republic constitute major risks for economic prospects in the West Africa sub-region between 2019 and 2020. Single Currency in 2020 remains laudable, the asymmetries in macroeconomic conditions and differences in economic progress and rates of convergence to macroeconomic targets pose formidable challenges that would make it impossible to be realised. These revelations were made in Abuja, Tuesday at the launch of the 2019 African Economic Outlook and West Africa Regional Economic Outlook. According to the report, West Africa's 15 economies are diverse across many dimensions of development, adding that in 2018, income capita ranged from $452 in Niger to $3,678 in Cape Verde. Nine countries reportedly witnessed a growth of at least 5.0 per cent in 2017 and 2018, it said, noting that five have been growing at that rate since 2014-2016. According to the report, while growth in those countries has been driven by agriculture, the service sector has emerged to complement agriculture. It stated that historically, higher prices for the region's commodities have bolstered growth, pointing out that a sustained recovery in prices, conditioned on strong global demand could improve growth and macroeconomic conditions in the short to medium term. 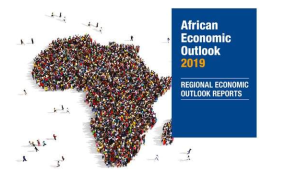 However, it alluded to major risks for the region's economic prospects in 2019-2-1- to include the fragile security conditions in Northern Nigeria, Mali and Niger Republic. In his address, the AfDB President, Dr. Akinwunmi Adesina, who was represented at the launch by the Bank's Senior Director in Nigeria, Mr. Ebrima Faal observed that Nigeria's recovery from economic recession will provide positive spillovers for West Africa's regional growth over the short to medium terms. According to him, after Nigeria's 2016 economic rescission and the much-improved growth rate of 1.9 per cent in 2018, the economies of countries like Cote d'Ivoire made faster growth with a GDP of 7.4 percent while Senegal posted seven per cent GDP. He expressed optimism that with the successful conduct of the 2019 general elections and the government's commitment to the implementation of the Economic Recovery and Growth Plan (ERGP), the future looks brighter for the region. "I believe in the popular saying that if Nigeria sneezes, other countries in the region will catch a cold. "With the expectation that foreign capital flows will increase post-election and oil prices and production are favourable, optimism for macroeconomic progress and stability in Nigeria is strong and this growth trajectory should be sustained. "West Africa recorded 3.3 per cent GDP in 2018 while the regional growth is projected to average about 3.6 per cent in 2019 and 2020, based on gradual recovery of commodity prices especially gold, cocoa and cashew nut," he said. Adesina stated that countries belonging to the West Africa Economic and Monetary Union (WAEMU) enjoy relatively low levels of inflation, mainly owing to the peg of their currency to euro, which limits the transmission of global shocks evident during the 2016 economic recession. He added that even last year's much-improved growth rate of 1.9 percent masks faster growth in some economies in the region such as Cote d'Ivoire (7.4 per cent) and Senegal (7 per cent). "The good news is that Nigeria has recovered from the last recession. This will have positive spillovers for the region's growth trajectory over the short to medium term. With the successful conduct of the 2019 general elections and the government's commitment to the implementation of the Economic Recovery and Growth Plan, the future ks bright for the region. "In addition, with the expectation that foreign capital inflows will increase post-election and oil prices and production are favourable, optimism for macroeconomic progress and stability in Nigeria is strong. This growth trajectory should be sustained," the AfDB President advised. However, he noted that the issue of external debt is back on the radar in many West African countries, adding that average external debt is rising and has nearly doubled over the past six years to 23.6 per cent of GDP at the end of February 2019 compared with 13.5 per cent in 2013. "This has increased the burden of serving external debt. The delicate security bsituation in some parts of the region also continue to impede economic performance and social stability in West Africa region," he said. Adesina also stated that migration was another concern, fundamentally driven by rising (youth) unemployment, stressing that it was important "for us to know and understand these challenges, because theses issues need to be present in the dialogue we engage with our regional member countries, and factored in when designing development projects and programmes." He pointed out that there were significant structural and externally-induced downside risks to the growth forecast of the region in 2019, adding that the unresolved trade tensions between the United States of America and China, the Middle East crisis and the recurring sanctions on Iran, the uncertainties surrounding BREXIT, as well as they predicted slowdowns in major European economies like Germany and france pose threats to the West African region. "These could affect trade and fiscal balances for Africa's net commodity exporters while further weaken the already dwindling foreign capital inflows to Africa. Remittances could also shrink," he said.